The first 10 - 15 minutes of practice is crucial for setting the tempo and getting players warmed up and engaged. The activities below are great for starting youth practices because they keep players moving, work on fundamentals, create competition, and increase the excitement level of players as you begin practice. If you run a variety of these activities on a regular basis you will a lot of improvement throughout the year on players' ability to improvise and be aware of their surroundings, in addition to their impovement of their core fundamentals. Line up all the players along the goal line. Have all the players put their sticks down behind the goal line (game is played without sticks). Select 2 or 3 players to go into the neutral zone to become “sharks”. The “sharks” have to stay between the blue lines. On the whistle all the players on the goal line try to skate through the neutral zone to the other end without getting touched by a “shark”. If a player is touched by a “shark” then they become a “shark” and stay in the neutral zone with the other “sharks”. The game is played until there is one player left or the last player touched by a “shark” is declared the winner. Then to get un-frozen they have to get touched by a player that is not frozen. You can get creative with this as well. For example, if you are playing where the layers stand with their legs apart then you can make it where players have to slide between their legs. For the younger players even the act of getting up off of their stomach or off their knees provides good balance and coordination work. The young players also love this game. The players have a ton of fun while they are enhancing their awareness, agility, and balance. The players will line up on the goal line (with or without sticks) and the coaches will stand along the walls in the neutral zone with all of the pucks (or cones). On the whistle the players try to skate from one end of the rink to the other end without getting touched by a puck (or cone). The coaches pass the pucks (or cones) from side to side trying to hit the players. Coaches need to be aware of how hard is appropriate to pass the puck and make sure all passes are on the ice. When a player gets hit by a “torpedo” they must stop and take a knee. The game continues back and forth until there is one player left standing. 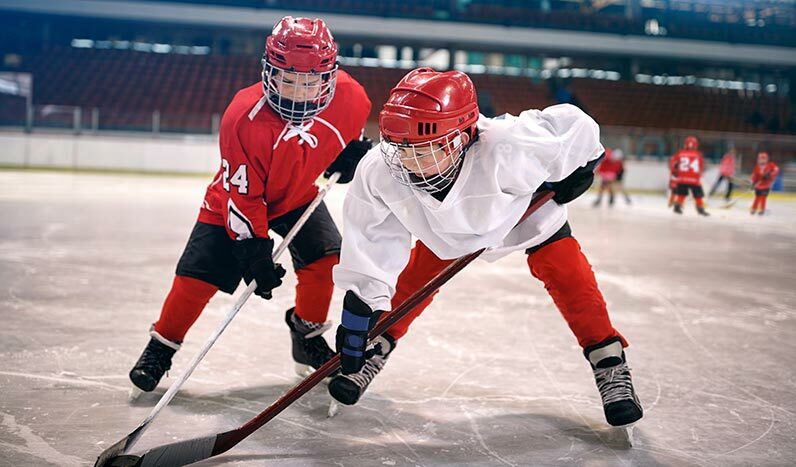 Here are a few fun activities which involve stickhandling and puck control. Every player starts with a puck. On the whistle players skate within the boundary while controlling their puck. Players will try to knock other players pucks away while maintaining control of their own puck. When a player loses control of their puck they must leave the playing area. View more details on King of the Hill Ice Hockey Drill / Activity. This game is also one in which every player is on their own. The first step is to determine the playing area and then place half the number of pucks as there are players into the playing area. On the whistle the players will try to find a control a puck. The coach will let the players compete for the 5 pucks for about 30 - 45 seconds. On the next whistle the players stop where they are. Any player that does not have a puck must either do push ups, sit ups, or skating exercises as specified by the coach. There are several puck handling activities below you can do by splitting up into pairs with one puck per pair. One piece of advice is to pair players together based on skill set. It is much more beneficial for players to do these activities with players of similar skill sets. In this activity the coach will define a boundary. The player with the puck will attempt to follow the player without the puck “chasing the rabbit”. The player without the puck should make it challenging by pivoting forwards and backwards, making tight turns, and skating into traffic. Allow the players to go for 30 - 45 seconds, blow the whistle, then have players switch roles. This activity will have one player skating backwards while the puck carrier follows them around the ice within the boundaries. This drill increases awareness in both players. The player skating backwards has to be aware of their surrounding so they do not collide with other players. The puck carriers are forced to control the puck with their head up as they follow their partner. Keep head up and be aware of surroundings. Being strong on your stick. Using body to protect the puck. Divide the players into two equal teams. Specify the boundary eg. the neutral zone. Place 6 pucks throughout the zone. On the whistle players on each team work together to control as many of the 6 pucks as possible. Players can pass to each other and use puck protection to control pucks. Blow the whistle after 30 - 45 seconds. The team that possesses the most pucks wins that round. You can add push ups, sit ups, or skating for the losing teams to increase the compete level if needed. As players start to understand the concept of the game and figure out what brings their team success then you can start to remove pucks from the game and increase the competition for each puck. Once you go down to one or two pucks then you will notice players need to do less one on one battling, spread out, and pass more often. To set up this activity place 5 - 10 “gates throughout the playing area. Each “gate” consists of two tires or cones placed about 5 feet apart. Players should pair up with other players of similar abilities with one puck between them. On the whistle the players will pass the puck as they move throughout the playing area. The players get a point for each “gate” they pass the puck through. They may not pass the puck through the same “gate” twice in a row. Once they pass through one “gate” then they must move on to a new “gate”. However, there is no limit to how many times they can pass the puck through each “gate”, they just cannot pass through the same one two times in a row. There are no measurables for the success of doing these activities on a regular basis but your eyes will be able to tell you after a few weeks of doing these activities if they are paying off. You should notice the young players controlling the puck with their head up automatically and looking to skate to open ice because these are basic concepts that will help them be successfull in these activities. Hopefully these activities and games will help develop good instincts in your young hockey players.